For the teetotalers among you, now there’s Napa Valley tea. Husband and wife duo Andy Erickson and Annie Favia are two of Napa Valley’s brightest stars—little wonder, given their backgrounds: Andy’s first winemaking job was at Newton, working with Chardonnay-producing legend John Kongsgaard, and then as Bob Levy’s assistant at Harlan, while Bond was being built. Later, he became the winemaker at Screaming Eagle, Ovid, Arietta, Dalla Valle, and, most recently, for Mayacamas. Annie’s viticultural work began with legendary grower David Abreu, where she had a hand in farming some of Napa’s greatest vineyards, like Ovid, Sloan, Bryant Family, Colgin, Harlan, Screaming Eagle, and Staglin. Together in 2003, Andy and Annie launched Favia, with the goal of growing grapes and crafting wines in their own unique style. Some 15 vintages later, seeking a permanent home for their family and winery, they moved to a historic parcel in Coombsville formerly owned by the Carbone family, who are among Napa Valley’s first Italian settlers. Today, Favia wines are produced in the original one-room ground floor stone cellar, which was constructed in 1886 and was the first winery in the area. The couple lives in the farmhouse above the cellar—they've fully restored the house, the winery, and grounds, which comprise a year-round vegetable garden as well as an herbal tea garden. Favia is the purest expression of who Andy is as a winemaker, and who Annie is as a viticulturist. The wines they are producing boast the kind of elegance and energy that can quiet a room. 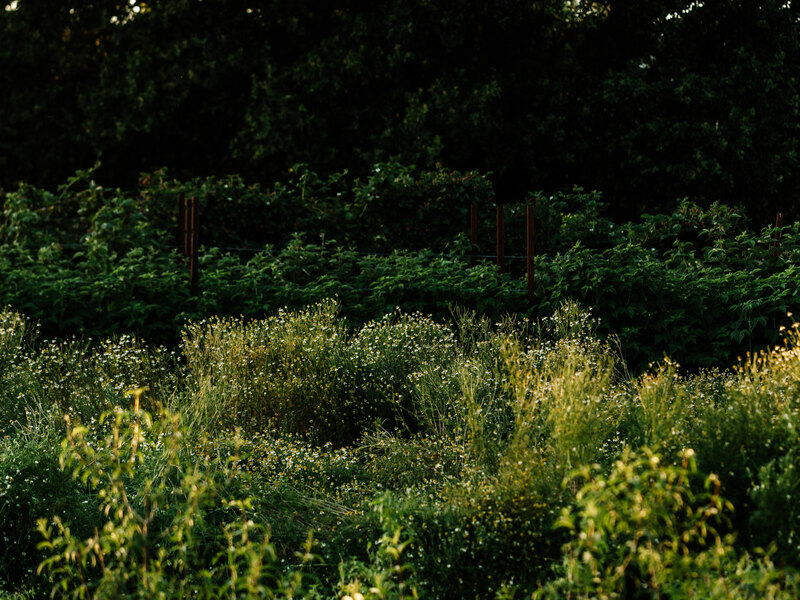 And last year, Annie introduced a new tea project, called Erda, one of the most exciting ideas to come from a Napa winery from someone with a tried and true green thumb. Annie is intent on using Erda as a vehicle to teach tea lovers about tea culture. “Our tea is farmed organically, and is whole leaf and flower—there are no bags, it is all loose-leaf herbal tea; all caffeine free, and meant to be about slowing down. You don’t brew this and get in your car and go driving," she says. "It’s a process—you benefit from the aromas, from taking time to smell the tea, and taking a moment to enjoy it... I’m growing herbals teas, which are caffeine free. 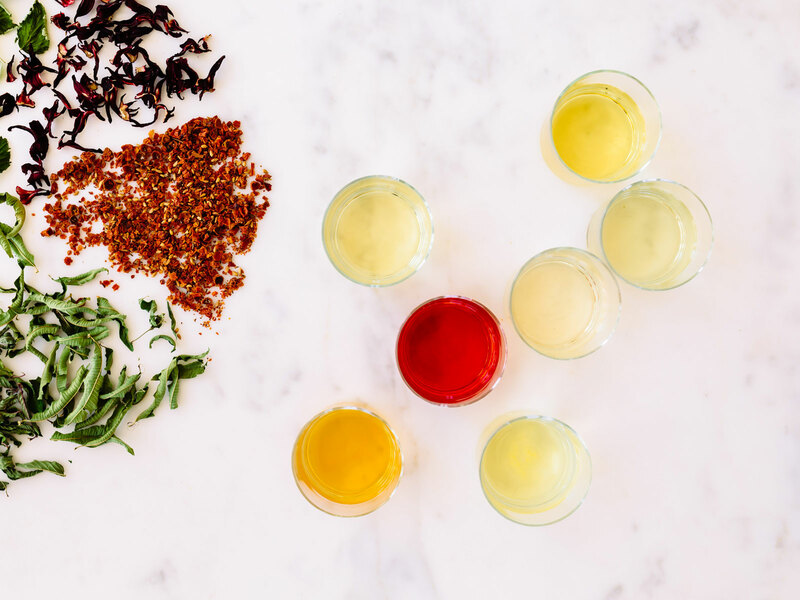 These teas need to be dried at low temperatures, to capture as many natural oils and natural color as possible—they drink like a fresh tisane, very subtle, bright, and clean." In early spring they begin harvest of Chamomile, Lemon Verbena, and the Mints. Summer brings Hibiscus and Mountain Tea and in autumn, Rosehips. Though available in very limited quantities, the teas ship nationwide. Feeling invigorated from our tea time, we toured the pristine, newly-renovated cellar beneath the couple’s kitchen. Andy poured glasses of Favia Grenache and we talked about the wines. “Under Favia, we make two Cabernet Franc wines and two Cabernet Sauvignons,” explained Andy, “one each from Coombsville and Oakville AVAs.” They also produce a few small-production gems like a Napa Sauvignon Blanc as well as a Viognier, a Grenache, and a Syrah wine from Amador County. These all fall into the collector-category for most, retailing from $75 and up. Since 2010, they’ve produced 16 wines and done everything from Marin County Riesling to an Albariño from Calaveras County in California. It’s a rolling release of cool stuff like a Grenache Rosé and an orange wine that was aged in barrel for seven years. A separate label, Carbone, is a Bordeaux-style blend which incorporates grapes from Favia vineyards and pays homage to the original family that owned the property. Room and Carbone would be their entry-level wines, with Room whites offered at $28 and up and Room reds offered at $42 and up, while Carbone gets up to $75. Before departing, I asked Andy about the multiple 100-point scores he’s earned over the years and what, for him, makes a wine, to borrow his own phrase, a “hole-in-one”? Between Annie’s grape-growing prowess and Andy’s depth of winemaking knowledge and talent, they are making wines which boast brilliant textures, defined structure, and polish. They are special and worth seeking out. And for the teetotalers among you, now there’s Napa Valley tea. From 30-year-old vines directly behind their property, this wine is aged 18-months in barrel, mostly neutral, with a tiny bit of new oak, and does not go through malolactic conversion. Lemon-gold in color, giving way to lemon curd and toffee notes, while the palate reveals lemon-drop sweetness immediately followed by tart lemon and baking spices, brimming with energy and juicy acidity. This screams for oysters, hard and soft cheeses, or halibut cheeks with tarragon and olio nuovo, or a tarragon butter rub. 321 cases produced. When redeveloping Mayacams, Andy found a vineyard on top of Mt. Veeder planted to really old vines of Chardonnay, and a bit of equally old Zinfandel. From these vines, the town of Santa Rosa comes into sight! The extremely high elevation produces a really unique Zinfandel, packed with dark berry notes, dried strawberry, a hint of balsamic and black pepper, and gorgeous pops of chaparral herb spice. A beautiful, balanced, and complex take on Napa Zinfandel. 97 cases produced. Whole-cluster pressed, bottled unfined and unfiltered from Izaya Vineyard in the In Chileno Valley. Medium-deep ruby in color with violet hues, dark ripe cherry notes mingle with incredible savory aromas or rose petal and smoky clove, juicy and layered with cedar-cinnamon spices and raspberry-blood orange, and pie spices finish. 317 cases produced. Named for the original family that owned the property, inky black in color, lavish and pronounced aromatics give way to marvelous high-toned spices, black olive and black currants while the wine itself is redolent of black fruit flavors supported by powerful, grippy tannins gliding to a long black-fruit finish tinged with sweet tobacco spices, crushed rock mineral, clove, and violets. 500 cases produced. Whole-cluster pressed, native yeast fermented, with 20 months in barrel of which 15 percent is new oak, unfiltered and unfined, this boasts incredibly fresh citrus flavors, round on the palate, with a long, spicy finish, and natural acidity, courtesy of high elevation. 188 cases produced. Considered their flagship wine, this is the 16th vintage. Mostly Cabernet Franc from 40-year-old vines with a bit of Cabernet Sauvignon from a high-elevation site in the mountains east of their property. Unfined, unfiltered, aged in half new French oak, an opaque ruby-colored robe reveals Asian spices tinged with red fruits, cinnamon, and plums. This is a wine you want to smell over and over, while the palate is expansive and complex, revealing layers of red and black fruit and, more spice and a panoply of textures that reveal themselves in every corner your mouth. 343 cases produced. One-hundred percent Cabernet Sauvignon sourced from two vineyards, opaque ruby in color showing Black fruits, blackberry and black cherry and Asian plum spices and cocoa-powdery tannin. Densely concentrated, but light on its feet bearing that Napa Valley intensity because of volcanic soils, but because of the grapes’ proximity to the bay, shows elegant crushed stone mineral and dried herbs. 340 cases produced.